The human foot combines complex mechanics and architectural strength. The foot and ankle serve as foundation, shock absorber, and propulsion engine. The foot can sustain enormous pressure because of the dissipation of force over all portions of the foot on contact. • 33 joints. More than 100 muscles, tendons (fibrous tissues that connect muscles to bones), and ligaments (fibrous tissues that connect bones to other bones); and a network of blood vessels, nerves, skin, and soft tissue. The parts working together provide the body with support, balance, and mobility. A structural flaw or malfunction in any one part can result in the development of problems elsewhere in the body. Irregularities in other parts of the body can lead to problems in the feet. Forefoot: The forefoot includes the toes and metatarsals and is important that it provides the ground contact area of the ball of the foot. 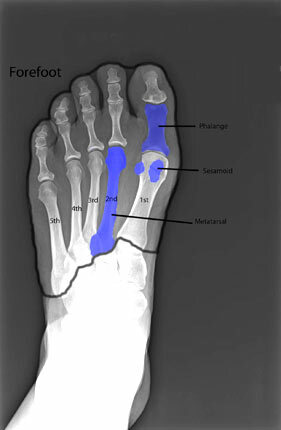 It consists of most of the bony architecture of the foot including the 14-15 phalanges to the toes, five metatarsal bones and the two sesamoid bones of the big toe joint. 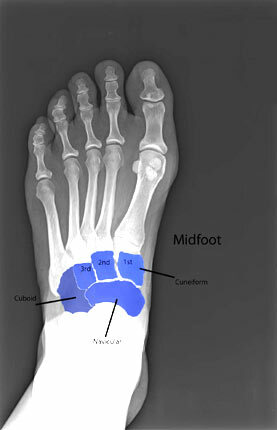 Midfoot: The midfoot is the intersection between the forefoot and rearfoot. 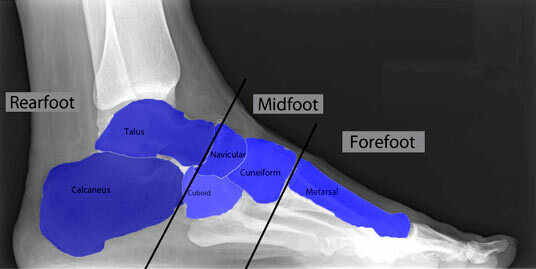 It’s anatomic location is at the peak or highest part of the arch and has important joints connecting it to the forefoot and the rearfoot region. It Consists of five bones including three cuneiform bones, navicular and cuboid. Rearfoot: The rearfoot connects to the midfoot and to the ankle and provides the ground contact area of the heel region of the foot. It consists of the bony architecture of the calcaneus and talus. Ankle: The ankle connects the rearfoot with the lower leg. 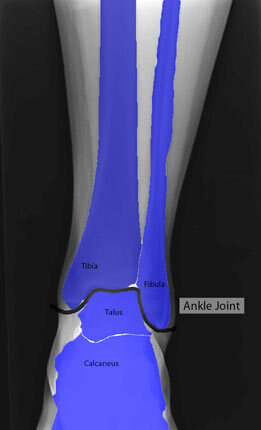 It’s bony architecture consists of the talus and the tibia and fibula.